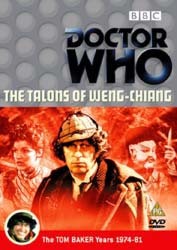 Talons of Weng-Chiang marked the end of an era - a golden age when Doctor Who was always good and sometimes really good, as is the case here. For six perfectly paced and well acted episodes we get to see the show at its very best in more ways than one. The story has been loving restored to look its pristine best and a great collection of extras have been amassed to create a quite superb double disc set. DVDs really don't come much better than this. In truth there really isn't much of a story on offer - a time travelling war criminal lands in Victorian London in search of his stolen time machine - but the cast of supporting characters, some great dialogue and a thick London fog, combine to good effect so that even when very little is happening there's always something to enjoy. And the production even manages to be quite scary at times - enough to give those of a delicate disposition a case of the Uberzootics. The elements that are supposed to mar the story - the giant rat and some dodgy oriental makeup - are far less intrusive than popular mythology would have you believe and as everything else works so well (especially the music hall setting where much of the early action takes place) it's easy to forgive a couple of minor hiccups. If only the stories that were to follow were as good as this. The extras, a complete second disc's worth, include some interesting behind-the-scenes footage, the Whose Doctor Who documentary, interviews, a photo gallery and some great Blue Peter clips. And you get all this effectively free: Talons' two discs sell for the price of a single issue. Was there ever such a phantasmagorical chronology of enticing entertainment? Did you ever apperceive an account so fiendish in all its aspects? Prepare to have your perspicacity confounded... make ready to enter the cabalistic cabal of Weng-Chiang where the malignant machinations of the mad master of ceremonies will electrify and enrapture even the most jaded of palettes.